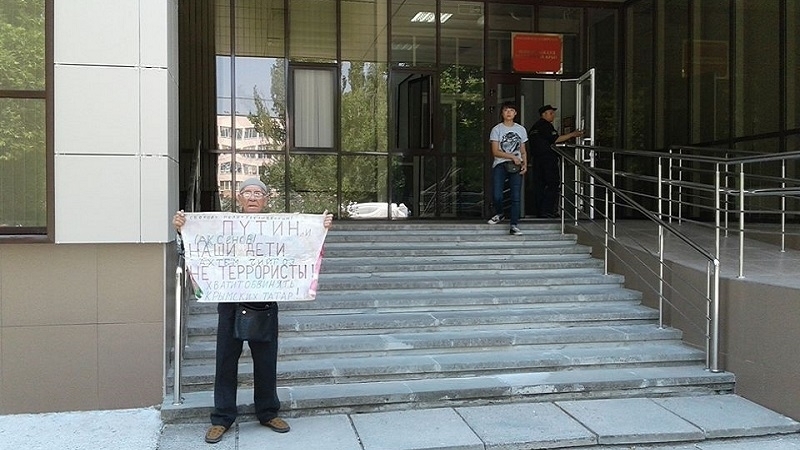 Russian security forces in the occupied Simferopol detained an elderly activist for a single picket. Later, the Crimean Tatar activist was fined. August 8, Server Karametov, who went on a single picket to the building of the Kremlin-controlled "Supreme Court" of the annexed Crimea, was detained by Russian security forces. Reportedly, the elderly activist went to a single picket in support of Akhtem Chiygoz, in the case of which the debate continued in the court. Head of the Central Electoral Committee of the Qurultay of the Crimean Tatar people Zair Smedlyaev published a photo which shows Server Karametov holding a poster with the inscription "Putin! Aksenov! Our children (Ahtem Chiyhoz) are not terrorists! Stop charging the Crimean Tatars! " Later it became known that the activist Server Karametov had a Parkinson's disease due to which his movements are not balanced. Security forces, in turn, presented this as disobedience and alleged that an elderly activist “was struggling out," lawyer Emil Kurbedinov stated. Also, the lawyer noted that Karametov has to take medicines three times a day for health reasons. And he was not able to take them because of detention. Kurbedinov asked all the witnesses who saw the detention of the Server aga near the "Supreme Court", to respond and speak at the trial, to testify on this event. The same day, on August 8, the Kremlin-controlled Railway District Court of Simferopol fined 76-year-old Crimean Tatar activist Server Karametov 10 thousand rubles, the Head of the Central Committee of the Qurultay of the Crimean Tatar people Zair Smedlyaev informed on Facebook. In the court building Karametov became ill, since he was not given an opportunity to take his medicine. The security forces had to call an ambulance. Karametov was found guilty for Part 1 of Article 20.2 of the Code of Administrative Offenses (violation in the holding of a public event or in procedure for its organization by the organizer). At present, the Crimean Tatar activist was released. Consideration of the second administrative case - the Disobedience to the lawful order of a policeman (article 19.3 of the Code of Administrative Offenses) – is to be held today. According to lawyer Emil Kurbedinov, in the court it turned out that one of the protocols on Karametov contained additional information which was absent when the old man was handed a copy of the document after his detention. “One of the numerous violations in the case against Server is the protocol of an administrative offense. A copy, which was handed to the Server aga, differs from the original one in the lawsuit. The "judicial" protocol included new circumstances of the case added later! A police tried to explain it somehow referring to the heat... Then they tried to blame this on the judge ... then they just got stuck... I did not understand it. As well as the others," Kurbedinov said.